Women in rural ares including Muslim neighbourhoods are actively seeking family planning measures, at times against the consent of their family members. This is a new development. Rising economic constraints have further encouraged couples to pragmatically opt for DMPA and other family planning options. Commissioned by ABT Associates, I photographed their programme across Uttar Pradesh and Bihar in Northern India. Initiated in 1951, India was one of the first countries to adopt a national family planning programme. Led by the Ministry of Health and Family Welfare (MOHFW), the programme today offers six contraceptive methods: condoms, combined oral contraceptive pills, IUDs, male and female sterilisation, and emergency contraceptives. Clients can access these methods free of charge from an extensive network of public health facilities. Condoms, combined oral contraceptive pills, and emergency contraceptives are also distributed by frontline health workers in rural communities. 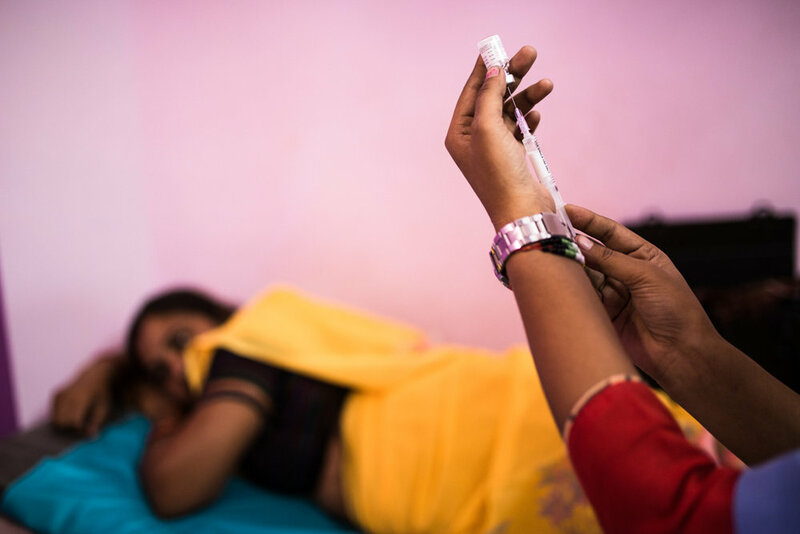 ABT Associates and SHOPS (Strengthening Health Outcomes through the Private Sector), a flagship initiate of USAID, has been promoting family planning options in India including the Dimpa programme. Depot Medroxyprogesterone Acetate (DMPA), an injectable contraceptive is promoted in urban and rural areas of India alongside other family planning methods through direct community outreach as well as partnerships with private nursing homes, neighbourhood clinics and pharmaceutical stores. The field team works relentlessly to accomplish these objectives. October, 2016. Samastipur district, Bihar. Mohd. Inamul with his wife Hamida Khatoon and their children at their house in Jorpura Village, Patori Blaock of Samastipur district. They are part of DMPA outreach programme. October, 2016. Raina village, Firozabad district, Uttar Pradesh, India. October, 2016. Patori Block, Samastipur district, Bihar, India. Pankaj, Village Health Champion of ABT Associates plays an educational video on family planning for men's group meeting in the village. He meets men individually to discuss about family planning options and debunk their myths and superstitions. A group of men watch an educational video on family planning for men's group meeting in the village. Pankaj, the Village Health Champion for ABT Associates meets men individually to discuss about family planning options and debunk their myths and superstitions. 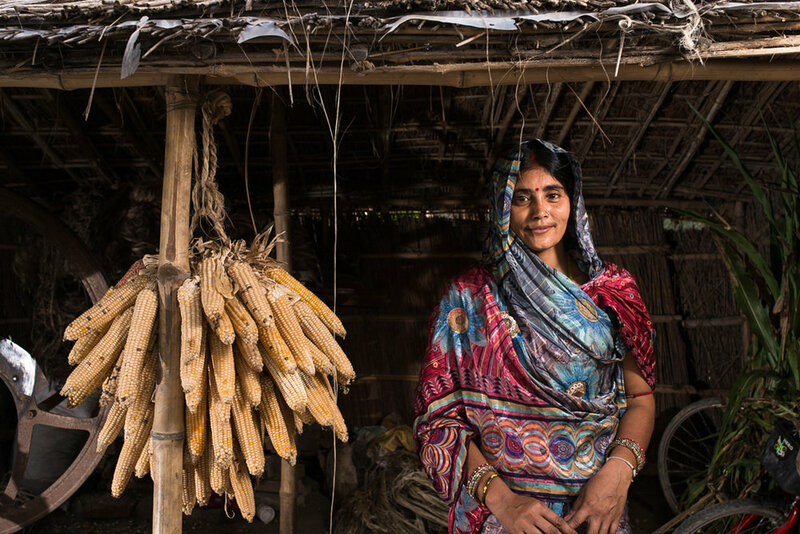 ABT Associates Community Health Mobiliser Geeta Sharma spends time talking to Devkumari walking her through al the family planning options, and why she should opt for one of them. Dharam Veer, Devkumari's husband prepares glass moulded gift items for Christmas from his house in Raina village, Firozabad district, Uttar Pradesh, India. Devkumari and Dharam Veer have five children, four girls and one boy. She said, "We wanted a boy so kept on trying until we had twins in our last delivery. One of them was a boy. We don't want anymore children. I want to opt for an injectible contraceptive option now". The last twins they had are just over a year old now. "We still havent used any contraceptive measure since the last delivery. That led to another pregnancy which we aborted by paying Rs 1200," confides Devkumari to a Community Health Mobiliser of ABT Associates during a one-one interaction. She acknowledges, "If I had used an injectible earlier, it would have been cheaper than the abortion". ABT Health Mobilisers had done a door to door visit earlier explaining family planning measures etc. but the couple didn't opt for any contraceptive option citing expenses. October, 2016. Vishnu Nursing Home, Samastipur district, Bihar, India. October, 2016. Navdeep Hospital & Research Centre, Agra, Uttar Pradesh, India. Premsheela Kumari (left) and Mamta Devi of Jalpur Village in Samastipur district consults the Resident Doctor of Vishnu Nursing Home on family planning options. October, 2016. Rawat Hospital, Agra, Uttar Pradesh, India. Neelam Bhagaur gets a DMPA injection at Dr. Neelam Rawat's clinic. She's been on DMPA since the last three years. October, 2016. Agra, Uttar Pradesh, India. A pharmacy store owner selling a DMPA kit. October, 2016. Jorpura Panchayat, Patori Block, Samastipur District, Bihar, India. 28-year-old Sangeeta Devi, has four children. She opted for DMPA after being counselled by a Community Mobiliser of ABT Associates. October, 2016. Firozabad town, Uttar Pradesh, India. Firozabad town is famous for its glass work. Men carry their finished bangles to the market to be handed over to the retailers. Many families in Raina village, where ABT Associates implements its family planning project, make their living by taking small jobs in the glass making industry. 30-year-old Anita Devi is a recent DMPA user. October, 2016. Firozabad, Uttar Pradesh, India. Copyright ©Sharbendu De/ABT Associates, 2016. All rights reserved.